Jobs for Tennessee Graduates (JTG), an affiliate of Jobs for America’s Graduates (JAG), is a non-profit organization dedicated to stewarding high school students toward graduation with follow through toward post-secondary education and/or job opportunities. HOW DO YOU DETERMINE WHO IS A JTG STUDENT? Through pre-testing along with a collaborative effort among the JTG Specialist, CTE Director, guidance counselors, and other faculty members, rising seniors with barriers to graduation are identified. Barriers can range from those students economically disadvantaged, excessive absences, with a disability, and who are basic skills deficient. Students also have the option of signing up for the one-credit general elective. On average, 35-45 12th grade students comprise a JTG class, which meets as often as other mandatory courses. DOESN’T TENNESSEE ADDRESS COLLEGE/CAREER READINESS ALREADY? Not specific to the population that JTG serves. 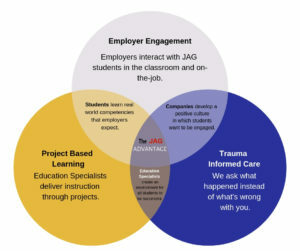 The JAG model is a three-part student-centered program focused on Project-Based Learning, Employer Engagement, and Trauma-Informed Care. Its concentrated curriculum emphasizes leadership, job interview skills, resume writing, financial responsibility, dress etiquette, and community service. 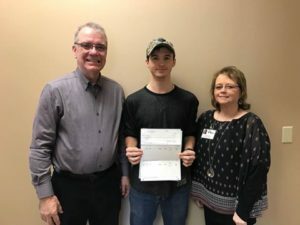 Through a variety of methods, JTG specialists drill down into these areas, guiding 12th graders toward graduation and more importantly preparing them for what awaits in the real world after earning a high school diploma. WHAT HAPPENS IN THE FOLLOW-UP PROCESS? Graduation is just part of JTG’s success. The JTG specialists continue the mentoring relationship with the recent graduates by tracking their progress in post-secondary education and/or employment. Specialists check on things such as: are they continuing to apply for scholarships? Are they going to class? Buying their books? Seeking employment? If employed, have they earned promotions? Only after the 12 month follow-up period, does the JTG specialist relinquish mandatory tracking. If a student does not graduate on schedule, he/she is still part of the follow-up process. The JTG specialists work with the young person to make sure he/she passes the HiSET exam and becomes employable. IS THERE DATA COMPILED TO MEASURE JTG’S EFFECTIVENESS? Yes. JTG programs capture critical data and information using a unique tracking system – Electronic National Data Management System – referred to as e-NDMS. JTG is committed to tracking and documenting three categories of critical information: students served, services delivered, and outcomes achieved. JTG specialists are responsible for entering data on current students as well as following up with students in a complete, accurate, and timely manner. e-NDMS, integrated with JAG National, can break down reports in numerous categories school by school. JTG can prove it does what it says it does. Please watch these short videos to learn more about JTG. JTG’s Out-of-School (OOS) program is designed to serve youth (ages 17-24) who have left the traditional school system and is interested in completing requirements for a high school diploma or pass the HiSET exam. Funded through State Workforce Development grants, the primary mission of the OOS program is to recover dropouts and to provide an array of counseling, employability and technical skills development, professional association, job development, and job placement services that will result in either a quality job leading to a career after graduation and/or enrollment in a postsecondary education and training program. Jobs for Tennessee Graduates (JTG), an affiliate of Jobs of America’s Graduates (JAG), is a non-profit organization dedicated to stewarding high school students toward graduation with follow through toward post-secondary education and/or job opportunities. Associated with JAG since 1981, JTG consistently obtains a graduation rate above 90-percent with 2018’s graduation rate 96%. JTG Specialists teach the JAG model during a student’s senior year, then add a 12-month follow up to ensure success after high school. Project-Based Learning (PBL) is a proven approach to prepare students for academic, personal, and career success, where other strategies and traditional curriculum have failed. Research has identified the principles of PBL as a foundation to move toward more learner-centered, inquiry-based, active learning methods. Elevating our education practices to gold-level standards will ensure learners gain the benefit of real-world relevance that is critical in today’s workforce. Employer engagement has been a cornerstone activity of the JAG program since its inception. In leveraging workforce development and work-based learning as an instructional strategy, it elevates the practice of employer engagement to an opportunity for meaningful connections between skills and ideas, and real-life situations. Imagine employers investing their resources, talent, and knowledge to customize individual learning experiences for JAG/JTG students. Workforce development and work-based learning instructional strategies advance effective employer partnerships to provide learners with the inspiration, motivation, knowledge, and skills needed to be successful in post-secondary education and career pathways. Unfortunately, an increasing number of JAG students have experienced trauma, and the JAG model is one of resiliency. It demonstrates how to build relationships, gives learners voice and choice (even more so through PBL), teaches life skills, and helps learners overcome adversity. HOW CAN YOU HELP IMPACT A YOUNG PERSON’S LIFE? JTG’s recent transition into the nonprofit sector means that the program is funded by generous donations to keep it sustained and growing. We rely on residents of the Volunteer State to invest in its future; the numbers don’t lie. JTG’s results are long-standing and proven, and by giving students the skills and expertise necessary to transition successfully into a post-secondary education or directly into the workforce, it allows the burden of the taxpayer to shift from being reactive to proactive.